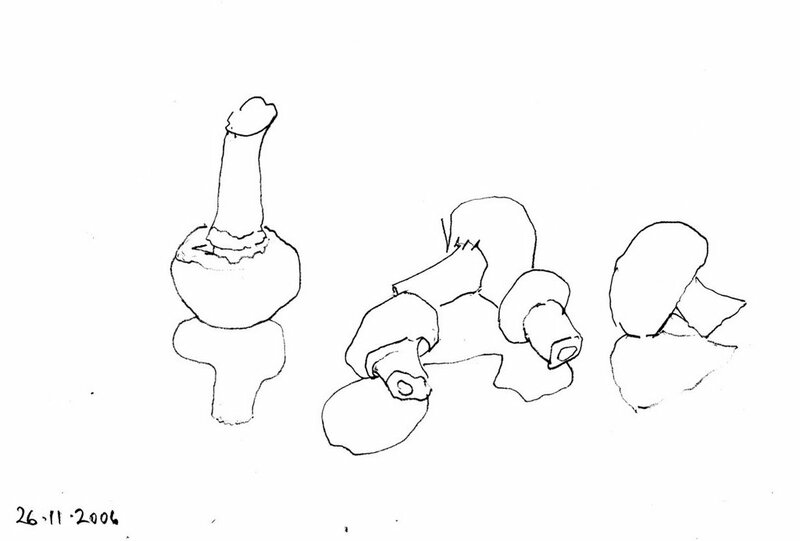 Mushrooms, pencil, 8.5 x 11 in. 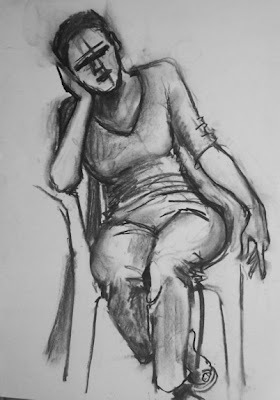 Figure drawing, charcoal, approx 16 x 12 in. 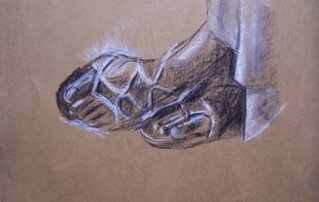 Another drawing of feet, by me; Conte crayon on brown paper, last week, from life. In Cézanne’s famous Still lIfe with Apples and Oranges, it has been claimed that the table is being shown from two viewpoints, and in fact the lower left part of the picture is very confusing. One oft-quoted theory is that the leg of the table is resting on a sofa. What is going on? 1) The table itself, is it parallel to the viewer (horizontal) or is it at an angle going into the picture, or both? 2) That round yellowish thing in the lower left quadrant, is it a drawer knob? Probably not, because it’s too big. So what could it be? After much pondering, I began to wonder if the lower left part of the painting could be explained by an additional tablecloth with a border and a big pattern. This would mean there are three different fabrics in the painting in addition to the white tablecloth: two in the background, a red and green one on the left, and a beige and green one on the right, and then, underneath the white cloth, another tablecloth with a big pattern and a border, placed on the table at an angle so that you’re seeing the border as a diagonal in the lower left of the painting. Seen in this way, the table could be straight on to the viewer, with the proposed new tablecloth draping over the corner of the table at far right. A Google image search shows that in the majority of Cézanne’s still lifes the table is in fact horizontal ; and the renowned critic Meyer Schapiro has said that the mass of the the objects in this still life is more or less horizontal across the picture plane. But these two things alone don't prove anything. More convincing evidence could come from another quarter: As a painter of still life myself, I’m conscious of how studio props may be used by painters over and over again in different combinations, so much so that you can sometimes identify the painter by the props. 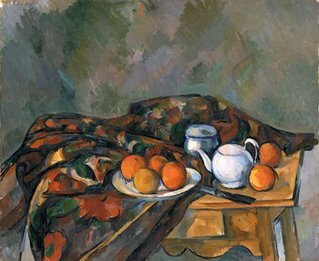 So, to find supporting evidence for my hypothesis, I set out in search of another Cézanne still life with the proposed new tablecloth in it. This was the mission: to find a still life by Cézanne containing a fabric with a large pattern and a border. To my amazement, I actually did find one, obscure as it may be, on the website of the National Gallery of Wales. It's called Still Life with Teapot (1902-06, left), and the big pattern and border of the fabric are consistent with the proposed new cloth. The bordered edge is even draped diagonally over the table edge. The colours are not identical, but this is not significant, because the purpose of still life painting is not necessarily to copy the objects. And as if that was not enough, earlier this year I had further confirmation that the hypothetical tablecloth really did exist in Cézanne’s studio. 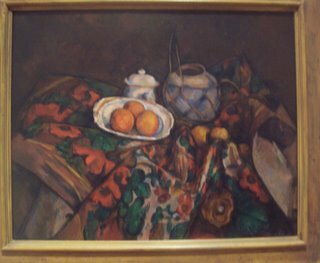 I came upon it, amazing as it may seem, in the Museum of Modern Art in New York: another Cézanne still life with the hypothetical cloth, called Still Life with Ginger Jar, Sugar Bowl and Oranges, 1902-06. So now I am reasonably sure that this is a valid explanation of this particular aspect of Apples and Oranges, or rather its lower left quadrant. It was a fun project, a little like detective work, and I was thrilled to come up with a plausible alternative to existing theories. But it has left me feeling sceptical about academic readings of paintings and still unconvinced about the role of multiple viewpoints in Cézanne's art; which in turn makes Cézanne's role in Cubism less clear. 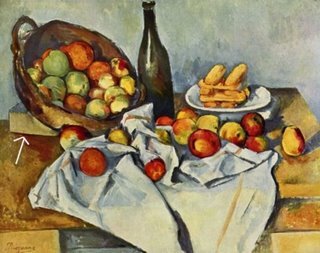 The consensus in the art books seems to be that Cézanne was the inspiration for Cubism. But in what way exactly? If one goes into the genesis of Cubism more deeply, to follow the trail back to Cézanne and lay it out in concrete terms, as I recently tried to do, the evidence turns out to be quite dubious. Or, one could start with Cézanne’s pictures and examine them for evidence of a connection going forward to Cubism, as I also recently tried to do. Again the evidence is dubious. Apples and Oranges (above) is a case in point. Art historians point to it as an example of Cézanne’s supposed use of multiple viewpoints. “Multiple viewpoints” is seen as a founding principle of cubism. It’s claimed that in Apples and Oranges the table as a whole is seen from one viewpoint, while the tilted plate of apples (mid-left) is seen from another viewpoint, higher up. 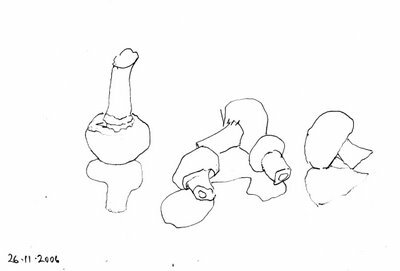 However, Cézanne was known to use things like wooden blocks and books to tilt objects upwards or forwards in his s till lifes. 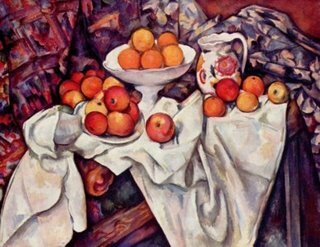 Often the block would be hidden by a cloth, but sometimes it was visible (e.g., image at left, Still Life with Basket of Apples, 1890-94, arrow). Therefore it’s safer to assume that a tilted plate in a Cézanne still life is the result of being physically propped up rather than assuming a revolutionary change in the method of picture-making. A supporting block may be more mundane, but it’s more likely to be true. Of course, if one now accepts the notion that the plate is physically tilted by a block placed underneath it, one might begin to wonder, why did he do that? That is another question altogether. I’d guess if one put one’s mind to it, a logical explanation would emerge, and in any case it’s not unusual for painters to use such devices in still life set-ups to get everything looking the way they want. But I do know that if the initial premise is wrong, the conclusion is likely to be wrong too, and I’m tending to feel that that is the case with the “multiple viewpoints” theory, both in Cézanne’s art and in Cubism. A view of some of Judith Shaw's work at Horizons, precision-hung by Christopher Cozier. Beverly Thomas is also featured. 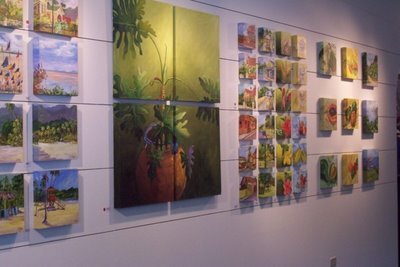 The show opened yesterday and runs until November 11.